The utilization of other median barriers, such as metal beam guard fence, may be appropriate based on the need to protect point obstacles in the median, such as overhead sign supports, etc. (See Sections 1-7). 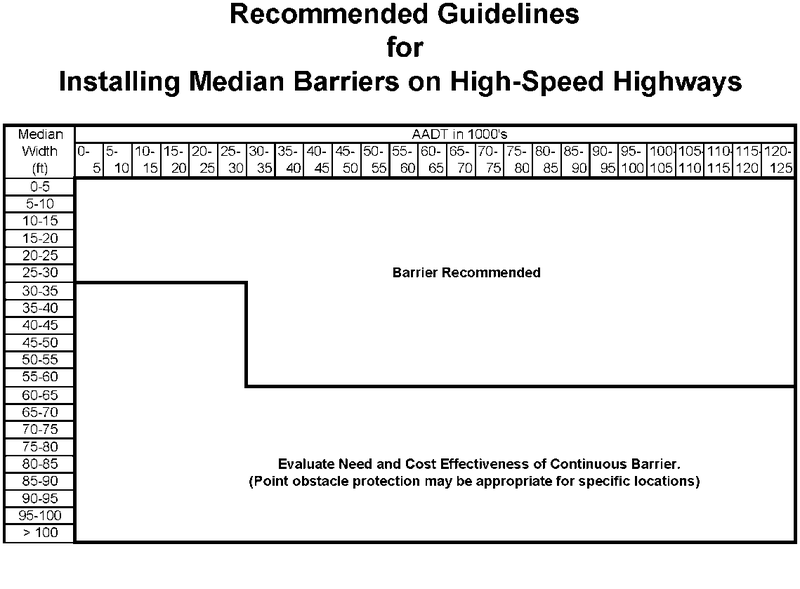 On high-speed highways, median barriers should be considered based on the criteria shown in Table 3. Flush medians or frequent crossovers may preclude the use of median barriers based on an engineering analysis of individual locations. The criterion is divided into two different zones by various combinations of average annual daily traffic and median width. Barrier Recommended: Barrier should be installed. Continuous barrier should be limited to areas where it is needed to reduce cross median incidents and should not be used for point obstacles (i.e. overhead sign bridges, etc. ), or in areas of lesser concern (i.e. wider medians, forested areas, etc.). As a general rule, a barrier should be placed as far from the traveled way as possible while maintaining the proper operation and performance of the system. The more lateral offset afforded a driver, the better the opportunity for the driver to regain control of the vehicle in a traversable median and avoid a barrier impact. The placement of concrete barrier adjacent to narrow shoulders is discouraged. Where possible, barriers should be installed on relatively flat, unobstructed terrain (1V:10H or flatter). Barriers may also be placed on 1V:6H maximum slopes as shown in Figure A-14. The centerline axis of the barrier shall be vertical. From the perspective of barrier performance alone, it is acceptable placement practice to locate the barrier at, or within 1 ft. [0.3m], of the bottom of the ditch line. If it is desirable to offset the median barrier more than one foot from the bottom of the ditch line to avoid drainage issues (potential for erosion, etc. ), the barrier can be placed anywhere along the 1V:6H median slope, provided it is located at least 8 ft. [2.4 m] from the bottom of the median ditch line. This offset from the bottom of the ditch line reduces the potential for the vehicle to strike the barrier too low for the barrier to function properly. If the slopes in the median are steeper than 1V:6H and barrier is needed, consideration should be given to regrading the slopes to meet the requirements or to filling in the median to place a split level concrete barrier. If regrading or other options are not feasible, placement of cable barrier on slopes up to 1V:4H is an alternative to consider. Designers should contact the Design Division for assistance in locating the cable barrier at the proper location along the steeper slopes. While not desirable, some median configurations may require barrier placement on both sides of the median to provide the proper protection.